Arizer Solo Review: Is This Vape Really Worth the Fuss? Greetings to all those avid dry herb vape enthusiasts out there, glad to see you’re keeping the good times rolling, without having to spend all that extra time really rolling… like we did in the old days. Yes indeed, legislation has been kind to us and as a result we’ve seen an explosion in the industry, of dry herb atomizers, table top vapes and the like. Let’s face it, using weed medicinally can’t be justified if you insist on smoking it the old way… filling your lungs with tar and nasty particulates, that’s why this week I’m undertaking the Arizer Solo Vaporizer review. Now the Solo has been receiving some shining reviews, despite it’s fairly massive size, clunky appearance and the inconvenience of it’s glass tube attachments: which one has to find a way to carry around. Apparently, this thing delivers a great and effective hit. I suppose that is what really counts to the user but for me, those naggy bits can be a deciding factor so we’re about to check it out and determine whether the ​quality on this so called portable device is really worth the fuss. The kit includes the Arizer Solo device, a glass bowl for aromatherapy application, two glass tube extensions for your dry herb use, some ​potpourri and an incredibly bulky standard wall charger. ​Yes indeed, depending on the consistency of your product and the particulars of your vaping style, you’ll find that variable heat settings are a handy little feature. Settings 1 through 7 provide you with a variable vaping experience and on the average dry herb stack, I find setting 5 to be a really sweet spot. This is an element of versatility that other dry herb devices don’t offer and you’ll find it works great with essential oils of every description. In spite of what tokers might say about the nullity of this feature, this is a nifty function for me as I swear by aromatherapy and I loved having a vaporizer that doubles as an aromatherapy device. This is one thing love about the device, you don’t have to worry at all about grinding up your product. Simply open the cap on the top of your device, fill the bottom of the glass extension up with a whole bud and stick it in the device, switch the device on and wait for it to heat up. Choose your heat setting, lights will make their way up the the device and reach the top when she’s ready to fire. 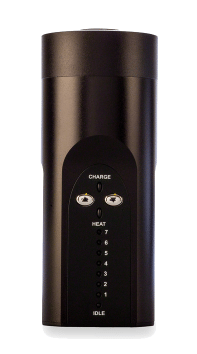 This model has been around for a couple of years now and the original Arizer Solo (with minor improvements) is still available to buy. Not only is this a testament to it’s good performance but many people who purchased their's around the time of release report that their vaporizers are still fully functional after all this time so maybe the sturdy, rather bulky frame pays off. Now, my own review only lasted a week but I can at least say that performance was consistently good throughout. During this ​review I found that the single lithium battery gave a pretty decent battery life of one hour steady use. Also the charge was pretty quick, roughly an hour to charge fully. ​In spite of the considerable cons this product has, the excellent quality I experienced during my review of Arizer Solo did actually carry it through in the end. You’ll find that the vape is incredible full (for a dry herb product), not just that, it’s also remarkable clean and smooth. Please remember...if you've never vaped dry herbs before, cannabis is a psychoactive drug and should only be used for medicinal reasons. So, this review did require some heavy vaping between me and the friends I invited to help me test it out… so one feature we found handy was the fact that this device operates just fine while plugged in so you can charge while vaping. This is ultra handy once you’ve sat back and started to relax after a few good draws on this device. The device will automatically switch itself off after a few minutes if you simply set it down without powering off. Yup, unfortunately that means that if you’re vaping the Arizer Solo whilst it’s plugged in, you won’t be able to set it down. You’ll find, however, that this is forgivable when you have a few friends enjoying the experience with you. Also, to be fair… medicinal cannabis use doesn’t exactly require you to continue vaping for many hours at a time. Yeah, not good. This is a real disappointment for me. The device reminds me of some obscure electronic devices from the 80’s that I would sometime’s find in my dad’s garage…purchased from TV and never really good for anything but gathering dust. It’s massive, clunky and according to your’s truly, pretty damn ugly. Super heavy and not easy to carry in your purse, ladies! As I found during my review, those glass attachments can be fun to use, reminiscent as they are of some more traditional modes of dry herb transport, however they are highly inconvenient when traveling. Also this device most certainly doesn’t offer the stealth, the discreetness of some other dry herb vap​orizers on the market and for this reason… as much as I enjoyed it’s at home application, it would never be my choice for a portable vape. Even though medicinal cannabis use is legal in most states, there’s not much joy in having a device that looks so incredibly illicit, especially if you want to use it within sight of folk who wouldn’t know any better, as is often the case. For a truly enlightening look at why you should definitely be using a vaporizer for your medicinal herb: check out this video. So, despite it’s clunky, old fashioned aesthetic… or rather it’s complete lack of any aesthetic charm whatsoever, this device proved itself to me​, not so much as a portable device but as a device that does it’s job well. A really good quality of vape and the best cloud production you can expect from this type of device. A remarkably clean hit with no necessity for grinding your ‘erbs makes this an outstanding choice for stay at home, medicinal cannabis users and aromatherapy enthusiasts alike!